A Yacht, A Mustache: How A President Hid His Tumor In the summer of 1893 and at the beginning of an economic depression, President Grover Cleveland disappeared for four days to have secret surgery on a yacht. 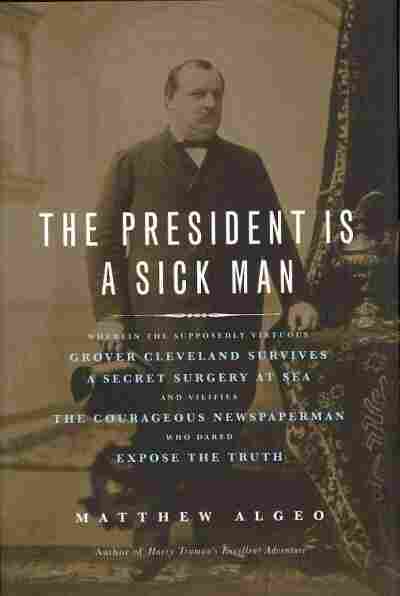 Author Matthew Algeo recounts the episode, and the lengths Cleveland went to to cover it up, in The President Is a Sick Man. It's In The Mustache: According to Algeo, President Grover Cleveland believed that if anything happened to his trademark mustache during his surgery at sea, the public would know something was wrong. 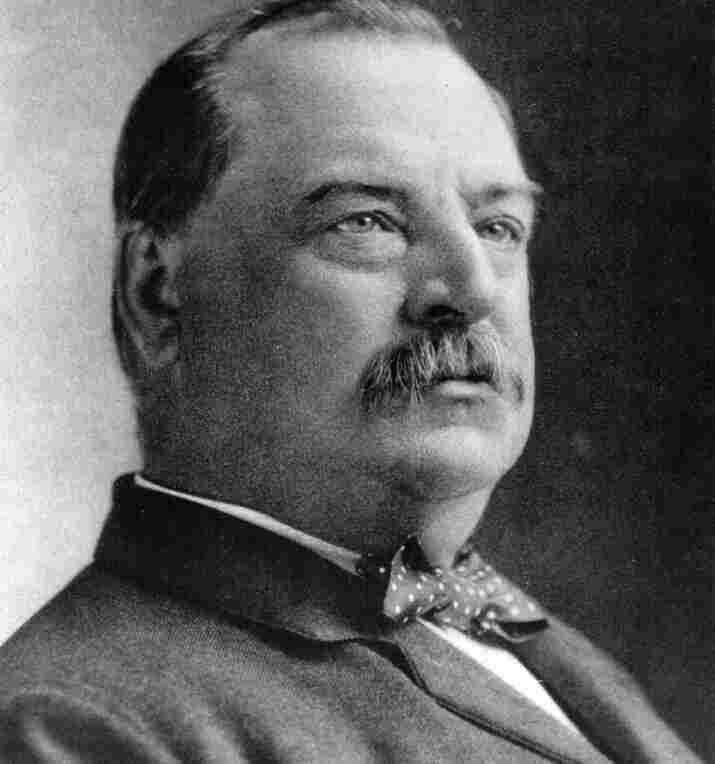 In the summer of 1893, President Grover Cleveland disappeared for four days to have secret surgery on a yacht. It was the beginning of his second term as president and the country was entering a depression, a delicate time in which a president's health was inextricably linked to that of the nation. So Cleveland decided to keep the surgery a secret — and so it stayed for years. "Shortly after he took office for the second time in 1893, he noticed a little bump on the roof of his mouth," Algeo says. "Around June ... he had noticed it had grown quite large. And the doctor diagnosed it as cancer, [saying], 'It's a bad looking tenant, and I would have it evicted immediately.'" Cleveland worried that news of his diagnosis would send Wall Street — and the country — into a panic. According to Algeo, that wasn't an unreasonable concern. "It would be a big deal today," he says. 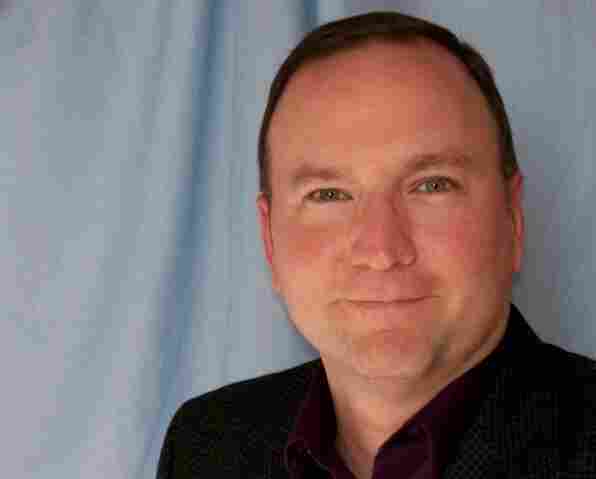 "It was an even bigger deal then because at the time there was a stigma attached to cancer. Newspapers would call it 'the dread disease.'" So Cleveland decided to have the tumor secretly removed. The plan was for the president to announce he was taking a friend's yacht, the Oneida, on a four-day fishing trip from New York to his summer home in Cape Cod. "And it was on that yacht that this operation was performed," Algeo says. "They assembled a team of six surgeons. [It] took about 90 minutes. They used ether as the anesthesia and they removed the tumor along with about five teeth and a large part of the president's upper left jawbone." The surgeons managed to extract the tumor through the president's mouth, which meant there was no noticeable scarring and the president's trademark mustache was left untouched — key conditions for keeping the public in the dark. Algeo says the operation was an extraordinary achievement in American medicine. "The doctors took incredible risks. I mean, it was really foolhardy," Algeo says. "I talked to a couple of oral surgeons [while] researching the book, and they still marvel at this operation: that they were able to do this on a moving boat; [that] they did it very quickly. A similar operation today would take several hours; they did it in 90 minutes." Even back in 1893, Algeo says, it was pretty unusual for the president to disappear for four days, so it wasn't long before people started talking. Two months after the president's "fishing trip," Philadelphia Press reporter E.J. Edwards published a story about the surgery which he had confirmed with one of Cleveland's doctors. The president flatly denied Edwards' story and even went so far as to launch a smear campaign to discredit the reporter. "So nobody believed E.J. Edwards," Algeo says. "He was dismissed as a disgrace to journalism." Edwards' story may never have made its way into history books if one of Cleveland's doctors, William Williams Keen, hadn't eventually come forward. "Twenty-four years after the operation — when all the other principals were dead — there were only three witnesses left to the operation," Algeo says. "And [Keen] decided it would be the right thing to do to publish an article to explain what really happened and to vindicate E.J. Edwards." The closest Cleveland ever came to confessing to the surgery was in a letter he wrote to a friend after the first doctor talked to Edwards. It reads, "The report you saw regarding my health resulted from a most astounding breach of professional duty on the part of a medical man ... I tell you this in strict confidence for the policy here has been to deny and discredit this story." Matthew Algeo is a public radio journalist who has filed reports from Minnesota to Malawi. The President Is a Sick Man is his third book. 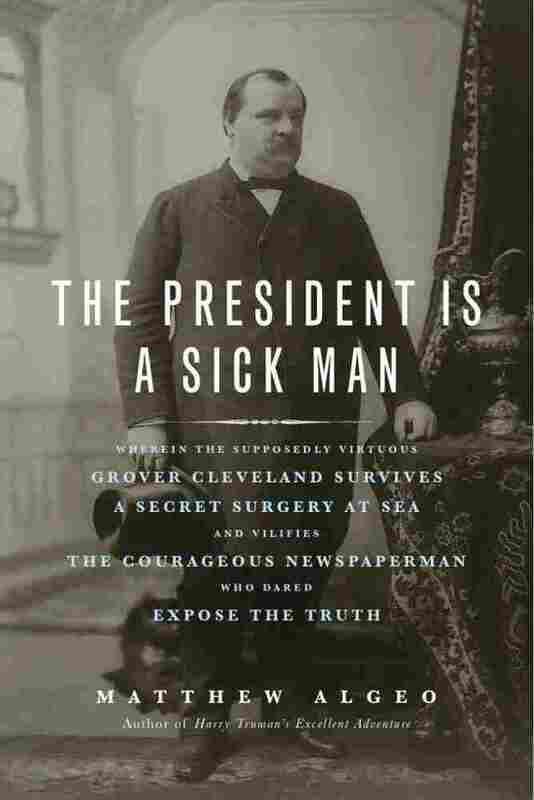 According to Algeo, the story of Grover Cleveland's secret tumor is part of a long history of cover-ups when it comes to presidential illness. In 1919, Woodrow Wilson suffered a stroke and was more or less incapacitated for the last 18 months of his second term; Warren Harding covered up his heart disease; John F. Kennedy hid his Addison's disease; and when Ronald Reagan underwent operations for cancer while in office, his wife, Nancy, insisted that the word "cancer" not be used in any official statement or release. "Even as late as the 1980s this idea of the president having cancer carried some sort of stigma with it," Algeo says. And while today it may seem even more impossible for a president to just disappear and have a major operation without anyone knowing about it, Algeo says it's actually much easier than you'd think. "Apparently, there is a fully equipped operating room on Air Force One," he says. "So if a president did want to disappear for a little bit and have an operation, it actually might be easier to do today than it was in 1893." Chances are, compared to that yacht, Air Force One would also offer a smoother ride — assuming, of course, that there's no turbulence. It was not an auspicious moment to assume the presidency, and Grover Cleveland knew it. "I hope the skies will lighten up by and by," he'd written a friend a few weeks earlier, "but I have never seen a day since I consented to drift with events that I have not cursed myself for yielding." He was about to take the reins of a nation teetering on the brink of chaos. The economy was in ruins. Unemployment was rampant. Stock prices were plummeting. Banks and factories were closing by the score. Just nine days earlier, the once mighty Reading Railroad had gone bankrupt. More and bigger businesses were sure to follow the Reading into insolvency. Foreign investors who had flooded the country with capital after the Civil War were retreating like Lee from Gettysburg. The Panic of 1893 was underway. It would spawn the worst economic catastrophe in American history, unsurpassed until the Great Depression. Cleveland, who was just two weeks shy of his fifty-sixth birthday, emerged from the hotel at eleven o'clock that morning and climbed into a gleaming black carriage for the short ride to the Executive Mansion. Though he weighed nearly three hundred pounds, Cleveland moved with an easy grace that belied his massive girth. 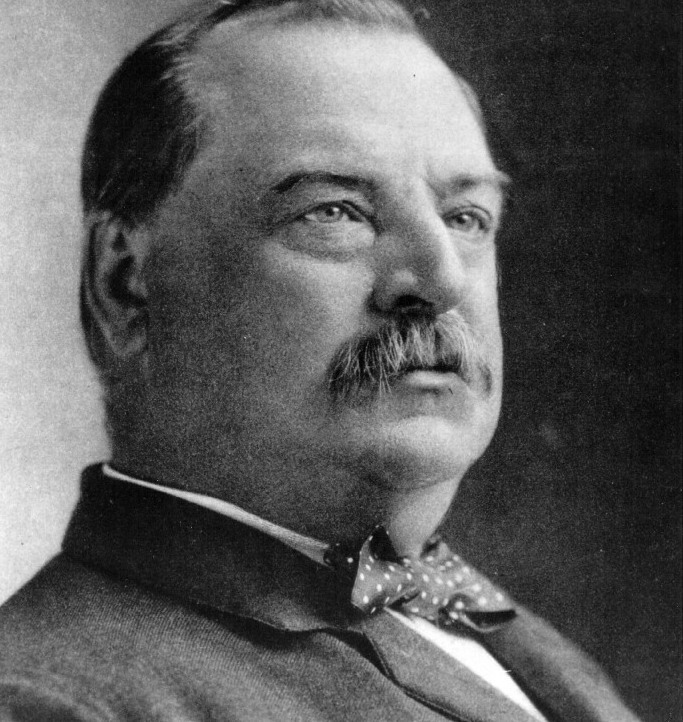 Just under six feet tall, nearly rectangular in shape, with thinning brown hair combed straight back and a big walrus moustache, Grover Cleveland was, figuratively and literally, the biggest political figure of his generation. Wrapped in a long, black overcoat with a velvet collar, Cleveland rode the open carriage to 1600 Pennsylvania Avenue. There he called on President Benjamin Harrison. Four years earlier, their roles had been reversed: Cleveland was the outgoing president, Harrison the incoming. The two men spent a few minutes in the Blue Room discussing the transition and then climbed into another open carriage for the mile-long ride down Pennsylvania Avenue to the inauguration ceremony at the Capitol. On the way they chatted amiably about the weather. Eight years earlier, in 1885, the sun had shone so brightly on Cleveland's first inauguration that "Cleveland weather" became a national catchphrase for a sunny day. But there would be no Cleveland weather on this day, for, as one congressman recalled, the conditions were "as bad as mortal man ever endured, windy, stormy, sleety, icy." When they reached the Capitol, Cleveland and Harrison went inside the Senate chamber for the swearing in of Vice President Adlai Stevenson. (Stevenson was the grandfather of the 1952 and 1956 Democratic presidential nominee of the same name.) Many dignitaries were delayed by the weather, and it was nearly one thirty--ninety minutes late — before the festivities moved outside for Cleveland to take his own oath. A wooden platform draped with bunting had been erected at the bottom of the steps on the east side of the Capitol. About ten thousand people stood shivering on the frozen ground to watch the ceremony. Frances Cleveland, Grover's wildly popular wife, was one of the first to emerge from the Capitol. As soon as she appeared, a huge cheer went up — the loudest of the day, according to some observers. Frances took special care walking down the slippery marble steps to her seat on the platform, for, unbeknownst to anyone outside her family, the once and soon-to-be First Lady was two months pregnant. Then came members of the outgoing and incoming cabinets, the nine Supreme Court justices, and assorted foreign diplomats in plumed hats. Finally, Harrison and Cleveland emerged, walking down the steps side by side. Harrison took his seat in a plush leather chair in the front row, while Cleveland removed his top hat and, without introduction or fanfare, walked up to the front of the platform. Snow had started falling again. Cleveland held his hat in his left hand. Facing a sea of black umbrellas, he launched into his second inaugural address. Cleveland was one of the most famous public speakers of his time. Befitting a man of his size, he had a booming voice — stentorian, as the papers liked to say. He once gave a speech to twenty thousand people at the old Madison Square Garden, and, it was reported, every single one of them could hear every single word. And he always delivered his speeches from memory, without so much as notes. His memory was said to be photographic. One newspaper reported that he could "repeat pages of poetry or of prose, after a single reading." But even a bellowing Grover Cleveland could not overcome Mother Nature. Without the benefit of artificial amplification, his words were scattered by the howling wind. The speech lasted about twenty minutes. The frigid crowd barely heard a word of it. Which is too bad, because, as inaugural speeches go, it wasn't half bad. He railed against "the waste of public money," and he gave one of the most unequivocal calls for civil rights that had ever been expressed in an inaugural, though it was expressed in his typically cumbersome way: "Loyalty to the principles upon which our government rests positively demands that the equality before the law which it guarantees to every citizen should be justly and in good faith conceded in all parts of the land. The enjoyment of this right follows the badge of citizenship wherever found, and, unimpaired by race or color, it appeals for recognition to American manliness and fairness." That same day, May 5, Cleveland noticed for the first time a rough spot on the roof of his mouth. It was near his molars on the left side — his "cigar chewing side." He assumed it was nothing more serious than a minor dental problem, and given all he had on his plate at the time — the panic, the money question, the office seekers, Frances's pregnancy — it's hardly surprising he chose to ignore it. Accounts differ as to whether the spot was painful, but by mid-June it had grown so large that it began to worry the president deeply. As Frances recalled many years later, it "often caused him to walk to floor at night." When Frances inspected the spot, she saw what she called a "peculiar lesion." Excerpted from The President Is a Sick Man: Wherein the Supposedly Virtuous Grover Cleveland Survives a Secret Surgery at Sea and Vilifies the Courageous Newspaperman Who Dared Exposed the Truth by Matthew Algeo. Copyright 2011 Chicago Review Press. Reprinted with permission of Chicago Review Press.